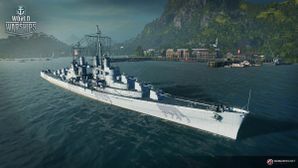 Flint — American promo premium Tier VII cruiser. Flint belonged to a series of cruisers with very powerful dual-purpose guns. The major difference from the lead ship was her short-range AA armament, which was improved at the expense of fewer main guns. Flint was originally available by reaching Rank 1 in three (3) separate seasons of Ranked Battles. She is now sold exclusively via the Arsenal. Flint is a Tier VII American cruiser that is a variant of the premium Tier VII American cruiser Atlanta, and is only available by reaching Rank One in three separate seasons of Ranked Battles. She plays very-similarly to Atlanta; she can be used as a slightly under-gunned light cruiser, or she can be played as "heavy" destroyer. Success in game depends on finding the sweet spot between the two. At 26,600 HP and a good chance that one of the heavyweights on the enemy team will hit critical areas if given a clean shot, it's best to weave through friendly traffic, get in close (the 5-inch main guns have a range of a touch over 11km) and spray whatever target is a priority with HE rounds. She'll do far more damage with fire than she will with actual shell impacts. AP rounds are highly situational with this ship as they will only penetrate broadside targets at point-blank range (less than 5km); however, they can be utterly devastating if her captain knows when to use them. Flint is one of the rare cruisers that has access to the Smoke Generator ( ). She - and her sister ship, Atlanta - are unique in the game in that they have unlimited charges of the Defensive AA Fire ( ) consumable. When coupled with her excellent anti-aircraft armament, she utterly shreds enemy planes. Flint’s torpedo armament is also improved over that of Atlanta; her torpedoes have a 9.2km range (versus Atlanta’s paltry 4.5km). Experience-making machine if you utilize all the bonus modifiers, camo upgrades, etc. Huge rate of fire, she can usually get all of her guns on target which gives her a ROF of 70 rounds per MINUTE. Fast, agile, responsive. Can get you into the fight fast, can get you out fast. If you see the shots coming your way can generally avoid them. Rewards a driver that thinks like a destroyer captain. This is a support (light) cruiser not a brawler. This ship can harass the enemy all day long. In and out, land shells and you're gone. Enemies will go nuts chasing you seeing the low HP and working for an "easy" kill. Excellent for picking off cripples or adding the "finishing" blow to a ship that your team is pounding on. While the enemy is trying to target a heavier light cruiser or battleship that is pumping shells at them every 15 or 30 seconds, you can rake the distracted boat with enough shells to really put the hurt on them. Excellent anti-aircraft suite that will put the hurt on enemy aircraft, as well as unlimited charges of the Defensive AA Fire ( ) consumable. Has access to the Smoke Generator ( ) consumable. This gives her a higher survivability rate than the average Atlanta. Lightweight, doesn't handle damage well. Tends to wind up with lots of disabled modules if she gets hit by something solid. Low health pool, as befitting a light cruiser. Fewer main guns than her sister ship, Atlanta. Puny 5-inch guns with only 11.1km range. This ship is all about quantity of fire rather than quality. Players are likely to die frequently in this ship. Even the best driver can't avoid every solid hit and she will crumple if anything above 12 inches rakes it. Extremely vulnerable to torpedo hits. A surprise or short range shot from a destroyer you didn't pick up will put a big hurt on Flint. As a premium ship, Flint doesn't have any upgrades to research. Tactical Advice: Stick with HE most of the time, she'll do more damage for you in the long run that way. Don't go toe to toe with anyone unless forced into it. Even some destroyers outrange and outgun her. Keep her speed up at all times and move, move, move. Twist, turn, vary her speed; anything to throw the enemy's aim off. This ship is a knife fighter and you need to use it like a shotgun. Fast, messy, quick hit and run close quarters combat. If she finds herself at the front of the pack staring down a couple of ships, she's probably going to get hammered. Practice predicting the "arc" of the shells. This ship has a ridiculously high rate of fire but at anything beyond 4-5km the shells come in at such an extreme angle that she's literally "raining" or "walking" shells across her target. If she ends up going one-on-one with someone and they can concentrate on what her arc of fire is doing even a large slow ship has a decent chance to evade most of the impacts. Focus on ships already under attack by allies, add her firepower to the carnage. Slot 1: Main Armaments Modification 1 ( ) Flint lives and dies by her weaponry, this upgrade will keep them in the fight longer. Slot 2: Damage Control System Modification 1 ( ) fires can be deadly for Flint, so take this to keep the chance of fires lower. Slot 3: AA Guns Modification 1 ( ) One of Flint 's strengths is her AA power. This upgrade will boost the strength of her outer AA envelope. Slot 4: Steering Gears Modification 2 ( ) Flintis a fragile ship and needs to duck and weave to stay alive. A faster rudder shift can help with dodging incoming shell fire. As a premium ship, Flint comes included with Type 10 camouflage that lowers her detection radius, reduces the accuracy of incoming shells, and increases the amount of experience she earns. USS Flint (CL-97) was a modified Atlanta-class light cruiser, sometimes referred to as an Oakland-class. She was named after the city of Flint, Michigan. She was launched on 25 January 1944 by Bethlehem Shipbuilding Corporation of San Francisco, California, sponsored by Mrs. R. A. Pitcher. She was and commissioned on 31 August 1944, with Captain C. R. Will in command. She was reclassified CLAA-97 on 18 March 1949. Flint's historical Measure 32/22D camouflage scheme is missing. The same pattern can be found on Atlanta. This page has been accessed 65,022 times.